Free the island's trapped souls! A sinister force has brought down your plane and left you trapped on a seemingly deserted island. What has brought you to the island... and how you can escape its hold? Help the island’s former inhabitants as you make your way through each stunning hidden object scene. 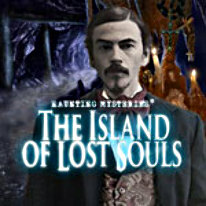 Collect clues and solve mind-bending puzzles to uncover the truth in Haunting Mysteries: The Island of Lost Souls.